The Guardian's Live Q&A: What is the best way to learn a language? Last week we took part in The Guardian's Live Q&A: What is the best way to learn a language? It was a fascinating two hours (and more) of live debate, much of which was cross posted onto Twitter - see #languagesdebate. Overall, the debate provided an evangelical call for the UK to put more effort and resources into language learning and many of the impassioned contributions focussed on the benefits of learning another language and just how much people who never consider the possibility of doing so, or are perhaps not sufficiently encouraged to do so, miss out on. We asked the panel for their views on the contribution that reading for pleasure can make to learning a language and were delighted by the response. It was clear that everyone on the panel felt very strongly about the huge contribution that simply reading interesing stories and articles can make. One person described reading for pleasure as the sole means by which she learnt two languages having started on very simple materials and progressed to more complicated texts as she felt comfortable doing so. The power of reading to help learners absorb and develop an intuitive understanding of grammatical structures was a point that was made and reinforced several times. The ability of reading for pleasure to extend vocabulary was also mentioned as was its ability to add depth to the understanding of the use of words already learnt by seeing them appear in different contexts and put to differing uses. The power of reading to be really effective for learning when people are reading something that they enjoy was also mentioned several times. There were also some problems that were raised, including the difficulty of easily accessing materials given that authentic reading materials are only appropriate for more advanced learners. Although the point was made that there are a lot of graded readers around, it was also pointed out that most of the stuff for less advanced learners is aimed at children. 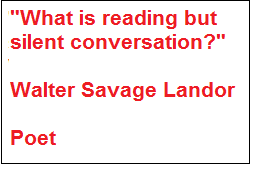 Overall the debate should provide huge encouragement to those who firmly believe in the value of Extensive Reading. Underlying many of the contributions was the conviction, based on real experience, that reading for pleasure without having to look up words and being able to 'go with the flow' makes a major contribution to learning a language. The comments themsevles can be read here - we were quite taken aback by the level of enthusiasm!